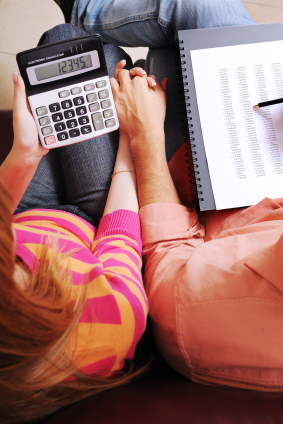 Do you and your spouse ever discuss finances outside of the when the bills are due? I mean sit down pull out the BUDGET, we call it a Cash Flow Plan, and talk about your finances. Which one of you is the Spender? How about the Saver? Do you talk about the consumer debt you have? Is there a Cash Flow Plan in place or do you fly by the seat of your pants hoping there will be enough money for the month? Tony and I used to have loads of consumer debt. There were student loans from Tony’s college days, 2 vehicle payments, around 10 credit cards that we maxed out, department store cards, as well as unpaid utility bills. I’m sure there were others that have escaped my mind. We had amassed over $50,000 in consumer debt. The hardest part for me were the constant calls from creditors, letters coming in the mail with past due notices, and no plan. I was STRESSED OUT. To add to all of this we were newlyweds! We spent the first 3 years of our marriage living month-to-month. We juggled the credit cards by getting a new lower rate one, transferring the balance from a high rate card to the new card, and then repeating the process as many times as possible. It finally came to an end when we could no longer get another credit card. Eventually the stack of bills, past due notices, and collectors calling got to be too much. We didn’t talk about our finances then. We just ignored this very large elephant in the room, never saying anything to each other about it. When we did talk about money we were yelling and arguing about the lack of money we had. The romance, passion, and intimacy that we had before we got married wasn’t there any longer. Money and debt were driving a wedge between us. Finally, Tony had enough of living month-to-month. He sat me down one night to talk about “our finances”. This was the first time we sat down and really talked about our money situation. We decided to find a credit counseling service in our area. We found one and with their help we developed a plan to pay off our debts. There was only one problem we hadn’t really learned how to manage our money. They gave us a way to get out of the debt we had but didn’t teach us how to avoid debt in the future. We also enjoyed going out with friends and living a very comfortable life but we weren’t ready to make a lifestyle change. Becoming debt-free required a radical change and we weren’t there. So, we kept living the lifestyle and the elephant was still in the room with us. Tony hiked the Pacific Crest Trail (PCT) in 2000 and shortly afterwards we moved to Spokane, WA. He needed the change of pace after hiking the PCT as well as spending some time away from Southern California. These 7 Baby Steps enabled us to GET MAD at our debt and finally pay it all off. Dave’s Baby Steps, (cash only, NO credit cards, NO debt) has made our marriage a happier one! I am happy to tell you that since 2002 we have not had a single credit card. Over the years this has meant that we do without sometimes, but I never have to worry about going to the mailbox and seeing a crazy, big credit card bill or answering the phone with someone who wants me to pay my bill to them. We have a roof over our heads, cars to drive, food to eat and clothes to wear. Do my kids get everything they want? NO. Neither do Tony and I. We save up for those large items and pay cash. Now, we talk about money openly in our family. The kids know that they can’t have everything they want. We talk to them about saving for trips and for expensive items that we want. Last year Alex “needed” a Nintendo DS. He saved his birthday money and Christmas money to get it. He paid for it with his hard cold cash and to this day he knows where it is and treats it with a lot more care than most other toys. We’re sharing all of this because over the past year, we’ve gotten soft. We didn’t get any credit cards or department store cards, but Tony and I haven’t been talking to each other and working together on our Cash Flow Plan. Money is coming in, but more is going out. Towards the end of last your we realized that our lack of planning was starting to affect us. With the start of a new year we decided it was a great time to get back into those “good habits” with our finances. So, what are we doing? You can do this too. Have a conversation with your spouse about your money. Talk about your financial goals, maybe you want to be debt free or take a vacation or buy a car. If you don’t know what you are working for how will you know when you get there? Develop a plan. He who fails to plan, plans to fail. We’ve all heard it and know its true-without a plan for your money it’s literally going to just disappear. For years we have had our monthly budget on an excel spreadsheet that we update every month. We take care of the basics first: tithing, shelter, food, utilities and health and then the other categories like preschool tuition, vacation, car maintenance etc. Just recently Tony came across this website PearBudget which allows you to set up and monitor your budget online. It’s very simple and straightforward and yes, it does have a nominal monthly fee ($3) but I am finding that this is a tool that works well with our lifestyle. Give it a try to see if it works for your family. There is a 30 day free trial. Do it! Don’t just talk about your money and the plan you have for it, live it. Give yourself a month or 2 to work out the bugs. Keep trying even if it gets hard. I can honestly say that the last 7+ years of being debt free have been amazing. The passion, romance, and intimacy that was missing in the early years of our marriage is back. How will you change your financial future? Please share with us what you are doing today to make a difference tomorrow. We're in the process of paying off debt. We didn't have as large a number as you guys, but we also didn't have much coming in, and I know exactly what you mean about the stress of having creditors calling. We're still with the credit counseling service, and we're getting there. We still don't have much of an emergency fund, as our car seems to break down every time we save anything, but we'll get there. I'm in charge of “financial stuff” in our home- completely. My husband wants nothing to do with it- he says “you just tell me what I can spend when, I trust you”. Money stresses him out more than anything else. I'm hoping that now that he's got a better job and we can start building our savings and paying off debt, he'll be willing to discuss things. Until he's ready, this is one thing I don't mind doing for him. Glad to hear that you guys are paying off your debt. We know from experience how having debt can cripple a marriage. We were so stressed out at times we had no desire to be intimate with each other. It sounds like you two on the same page with getting out of debt, but I would continue to engage your husband in financial discussions. This way when he is ready he'll at least be aware of what's going on financially. I know for myself I was this way for many years, just letting Alisa handle all of the finances. But, there came a time when I wanted to know what was happening so we could attack our debt and not have to deal with it ever again. Once I was on board it was amazing to be working together on our debt and achieving our goals together. You're doing great. When you are having to use your emergency fund to pay for the car that is better than using a credit card. Baby steps and you guys will get there. A great podcast to listen to is Past Due Radio, http://www.pastdueradio.com. Even though we've been out of debt for years I listen to Past Due Radio for pointers. @mrsembers – First off, I would like to congratulate you for bearing the entire burden, because I know just how heavy that weight can be, and I can tell by your comment that you truly desire for your husband to at least communicate with you about things. I am currently working with a lady that is in the same situation as you, and I can tell you that one thing you don't want to do is just wait it out. It will NEVER happen if you wait it out because your husband is in his comfort zone. I certainly do not suggest anything forceful but there are a few things you could do to try and open the doors of communication. I really need to say too that your husband is avoiding responsibility by putting it all on you and he really needs to get over that. Sometimes things can be hard, but we have to be mature and deal with them, and what he is putting you through is quite selfish. I know because I used to be him. I told my wife to do it all, “I trust you” I'd say. Then one day I realized the enormous burden I had placed on her by doing that. If things went wrong, her fault! If we lost the house, her fault! If the electric got cut off, it was her fault! Dave Ramsey opened my eyes and caused me to realize my selfish ways. I will never again put my wife through that again. It's our money, our life, and our problems, None of them are exclusive or without connection to the other. Here's what you need to do, or at least this is what I would suggest you do. You need to try to have that conversation with your husband that informs him of your desire to work together on the money side of things. It doesn't mean he has to draft the budget or work out the details but he should be there to give his input and ideas about how you both can reach your financial goals in life…together. Make it a heart to heart talk and tell him how much you love him and value his opinion. Explain to him the stress that handling it alone is causing you. If he won't open up to you that way write him a loving and warm letter and just pour your heart out without placing blame or pointing fingers. It shouldn't be about what he's not doing as much as it should be about what you need and why. The letter may work better because men tend to get defensive quickly face to face on an issue that makes them feel like less of a man. The letter will allow him to not feel attacked or backed into a corner. mrsembers, I hope I have not stepped over the line in my comment, but I tend to call things what they are, and your husband is being the same as I was—selfish. The last time I looked into my wife's eyes and saw those tears roll down her face all because money “stressed me out”, I knew I was a jerk. Your husband must know that money stresses EVERYONE out, not just him. I just don't want you to lie to yourself by thinking he will come around. He's avoiding it because he has no intentions of ever trying. Maybe I read your comment all wrong but it sounds so very familiar to me and I think you are too nice a person to try and cause waves, which is why you are willing to wait “until he's ready”. In my opinion money is one of the worst things you can force your spouse to manage all by themselves. I hope you take my words kindly and in love because I meant no harm at all. It hurt me to realize I had been such a selfish guy to my loving wife too, but it was worth finding out. My comment is so long I will spare you on the credit counseling service talk, but if you are interested and want to hear why you should drop them now, just let me know here in the comments. I know how you can do it without paying the fees and service charges, and I will tell you for free. I would love to help. Good luck mrsembers!